I didn’t go as far as buying a questionable pasta machine from Alibaba like Alex the French Cooking Guy but I did get some tools to help my noodle craft. I am never going back. Making the flour do its dance with just the right amount of water was the tricky part. It was a foot-stomping-seal-clubbing good old time. I used the foot-kneading method by folding and refolding the dough inside a ziploc baggie while kneading it with my heels on a hard floor. Take care in any cross contamination and make sure the dirty outside stays on the outside. 700g of dough is just about too much for a one gallon bag. Stomp it, fold it (through the bag) stomp it again. If you have to open the bag be mindful that the outside of the bag has seen your feet and your floor. Getting the dough INTO the machine is the hardest part. I just bought this so I don’t want to add a wedge of low moisture dough and wrench this thing apart. Use a rolling pin to get your portions (~150g each) to something resembling a sheet, no more than 0.75cm thick. 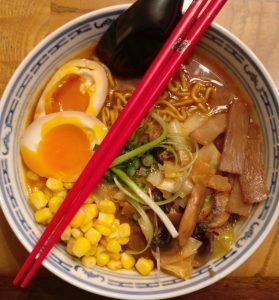 I did use the techniques pointed out by u/Ramen_lord from Reddit/r/ramen. I call it the ‘ramen noodle wiggle’. With such low moisture noodles you have to use the wide open setting to make the noodle sheet uniform, you’ll then use progressively thinner settings to get to setting 3 or 4, fold, and then use wide open pressing to gently press the folded sheet together. You’ll take this folded sheet through the settings, 0 through 4. Fold and repeat a couple more times as needed until the resulting sheet is uniform and soft. Some people tuck the ends so that you end up with a perfect rectangle. Sounds good. Not what I did, but sounds good. Two hands on the noodle product means better control. Less cranking means you’ll make more noodles more often. I’ll have an updated review of the noodles with full recipe in a day or so. Previous Post Holy Cow! My favorite ramen is at my supermarket! Does it hold up?